Gets twin rear mounted electric motors that produce 604PS and 950Nm of torque. Employs an 800V battery pack with 65kWh capacity; Aston claims a range of 321kms. The Rapid E has been co-developed with the F1 Williams team. Gets aerodynamic bits on the exterior to make it more efficient. Employs a lot of aluminium and carbon fibre in its construction to keep weight in check. Aston Martin’s all-electric vehicle brand, Lagonda, has revealed its first all-electric car, the Rapide E. Co-developed with the Williams F1 team, the Rapide E was unveiled at the 2019 Auto Shanghai. 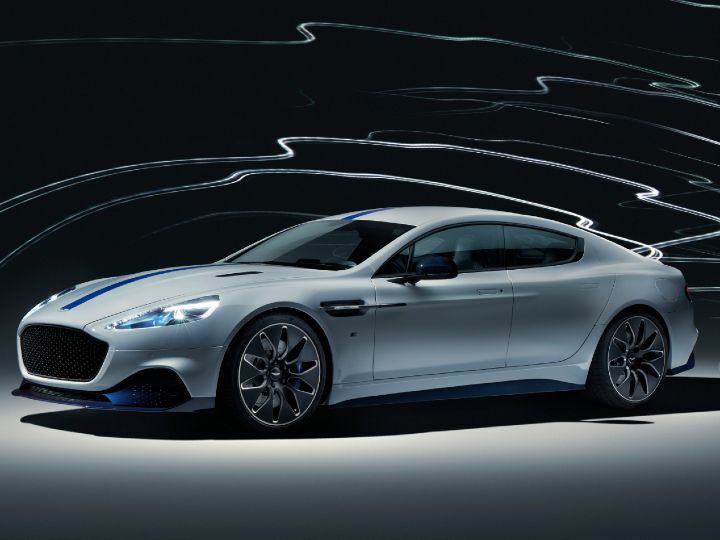 While Aston Martin has not revealed the prices of the Rapide E yet, it has announced that the all-electric sports sedan will be a limited edition model, with only 155 units slated for production. The Rapide E is powered by twin rear mounted electric motors which produce a combined power output of 610PS and a monstrous 950Nm of torque sent straight to the rear wheels. While the power output remains the same with the Rapide AMR, the Rapid E produces 320Nm more than the 6.0-litre V12 that powers the former. Aston claims that the Rapide E can get from a standstill to 100kmph in just 4.2 seconds and hit an electronically limited top speed of 250kmph. At full thrust, the EV motor spins to a bizarre 11,500rpm! To stop this behemoth, Aston has equipped the Rapide E with 400mm steel discs at the front and 360mm steel discs at the rear. Aston has also included other braking and safety aids like ABS with EBD, emergency brake assist and dark anodised brake callipers. Powering the high spinning electric motor is an 800V battery pack which is encased in a carbon fibre casing. With an installed capacity of 65kWh, the battery pack uses over 5600 lithium-ion 18650 format cylindrical cells. The bespoke battery pack is located where the V12 motor, gearbox and fuel tank were located. Aston also claims that the Rapide E has a range of over 321km and is capable of charging at a rate of 297km per hour using a conventional 400V 50kW charger. The battery pack also supports fast charging at the rate of 498km per hour when plugged into an 800V outlet that’s capable of delivering 100kW or higher. Talking about its design, the Rapide E looks similar to the Rapide AMR variant. The EV gets some touches to differentiate it from the V12-powered car. At the front, you get a honeycomb grille in place of traditional Aston Martin slats. It is flanked by sleek bi-xenon headlights with DRLs that also function as turn indicators. The Rapide E retains the typical four door coupe stance with a long bonnet and a sloping roofline at the rear. It also gets staggered 21-inch ‘Aero’ wheels shod with 245/35 R21 and 295/30 R21 Pirelli P Zero low rolling resistance tyres at the front and rear, respectively. Aston Martin claims that the Aero rims help improve the aerodynamics of the car for improved efficiency. At the rear, you get a sleek set of LED taillamps as well as a carbon fibre splitter. Loads of black cladding has also been added to the rear bumper to add a dash of sportiness and Aston has redesigned the underbody for improved efficiency and dynamics. The Rapide E is based on an all-aluminium chassis to keep weight in check. It also gets carbon fibre and aluminium body panels. On the inside, the Rapide E gets a new 10-inch digital instrument cluster which delivers info like the battery’s state of charge, current motor power levels, regenerative performance and a real-time energy consumption meter. The Rapide E also gets plenty of carbon fibre applique inside the cabin to give it a rich experience. Other features on the Rapide E include an 8-inch infotainment system, Aston Martin App with remote dashboard and support for Apple Carplay and Android Auto. The Rapide E will be the first EV from Aston Martin to be produced by the Lagonda division. It is set to be followed up with an all-electric SUV based on the DBX concept. When launched, the Aston Martin Rapide E will take on the Tesla Model S in international markets. 10-inch digital drivers display, 8-inch infotainment system, Apple CarPlay, Android Auto, carbon fibre interior trim.